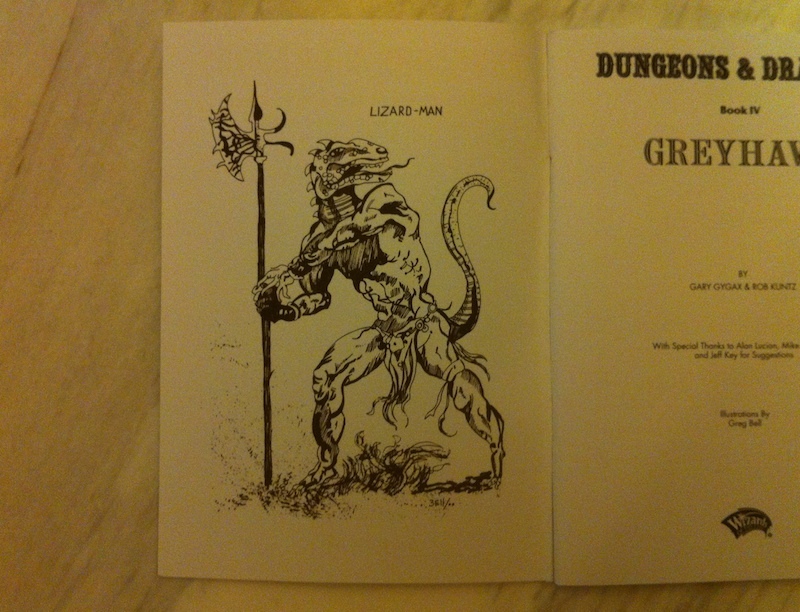 I was undecided and leaning against picking up the recent Original Dungeons & Dragons reprint until recently. 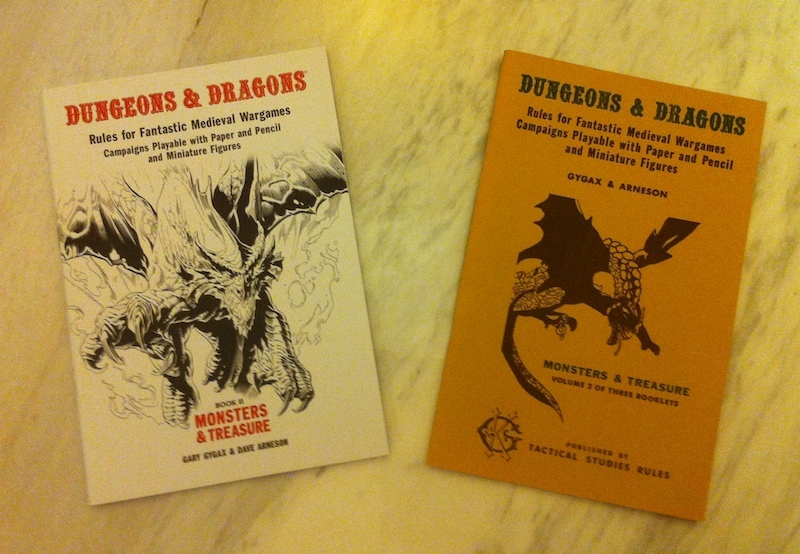 Before buying this set, of the OD&D booklets, I only owned the original 3 little brown books (the OCE set) in print, so getting access to physical copies of the supplements at a somewhat reasonable price was a big draw, and in the end I decided to go for it while it was still available, given that OD&D is one of my favorite RPG frameworks. Though I do not consider myself a collector, nonetheless a big part of the enjoyment of an RPG product for me is the physical artifact itself. As such, most of this review will regard the presentation of the product rather than the contents, which at this point I do not think need much review (go read Philotomy’s Musings if you want an intelligent discussion of how OD&D works). At the bottom of this post, I have included some photos comparing the premium reprint with the OCE set I picked up on Ebay a few years back. 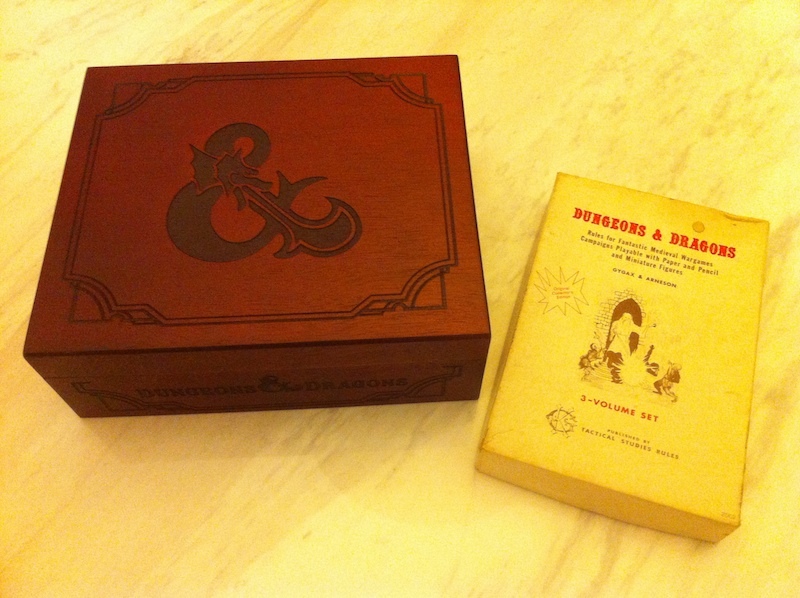 Compared to a standard, cardboard game box the wooden case that this set comes in is quite solid, and though it is not of the highest quality wood, it is well-constructed and the etching is attractive. The bottom is covered with some felt-like material, making it sit nicely on hard surfaces. 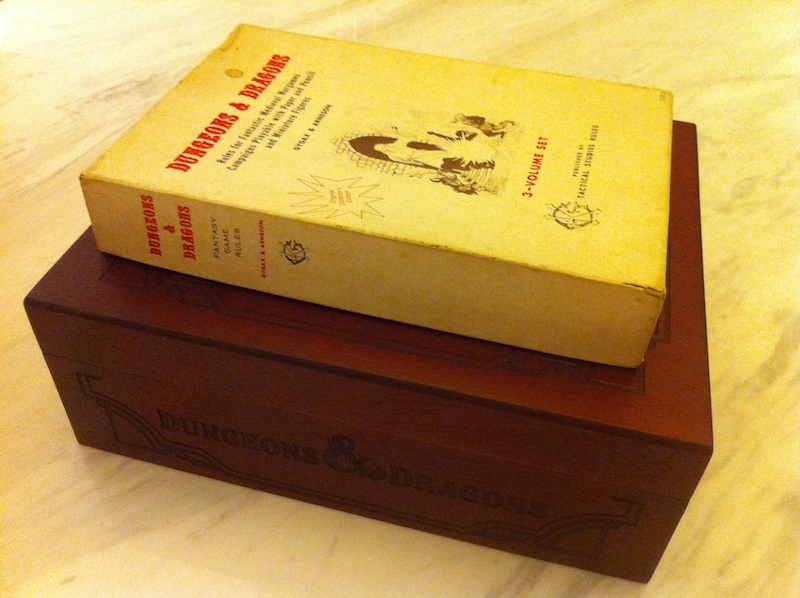 The external design is classy and understated, with simple carved borders, a large dragon-styled ampersand on the top, and the words “Dungeons & Dragons” in a traditional font on the side. I would love to see future D&D products with this aesthetic. 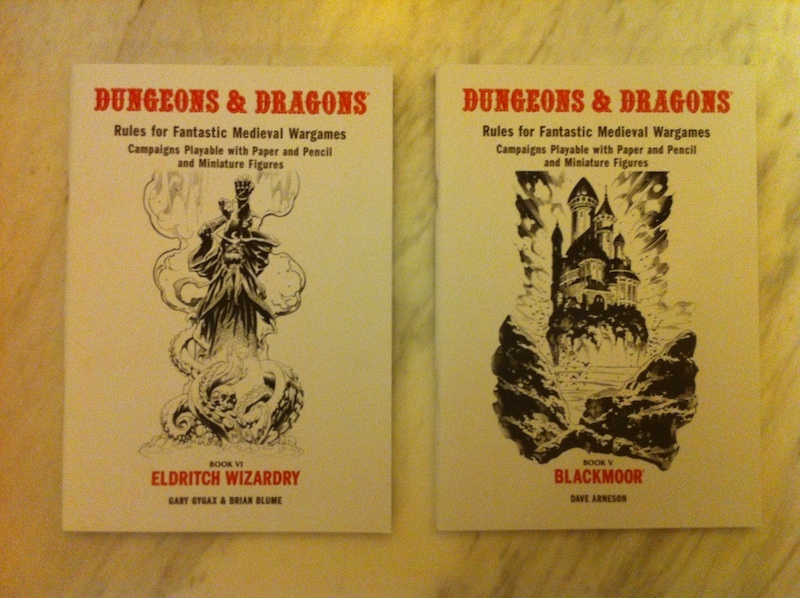 It has far more presence compared to the standard, loud fantasy art that most in-print RPGs use. That said, the art on the interior of the lid is only okay, and the cardboard “frame” could better have been omitted (though note that this does not impact the external appearance at all). Though the box is attractive, it would be a bit unwieldy to use it to actually transport game materials, and it seems designed more to sit on a shelf and look pretty. Hinges and a latch would have been appreciated to make sure that contents would not fall out when carrying it around. 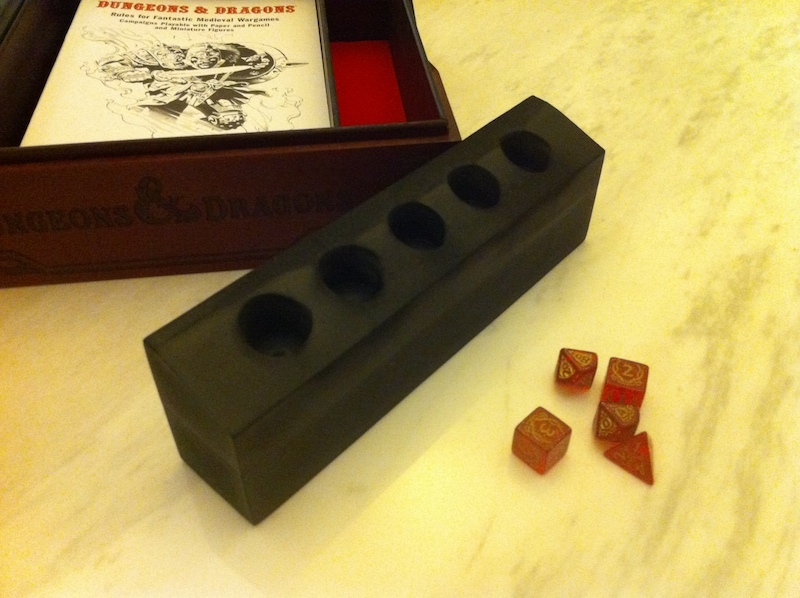 It is also a bit larger than it really needs to be, as about a third of the interior volume is dedicated to (high-quality) foam inserts used to hold the dice. 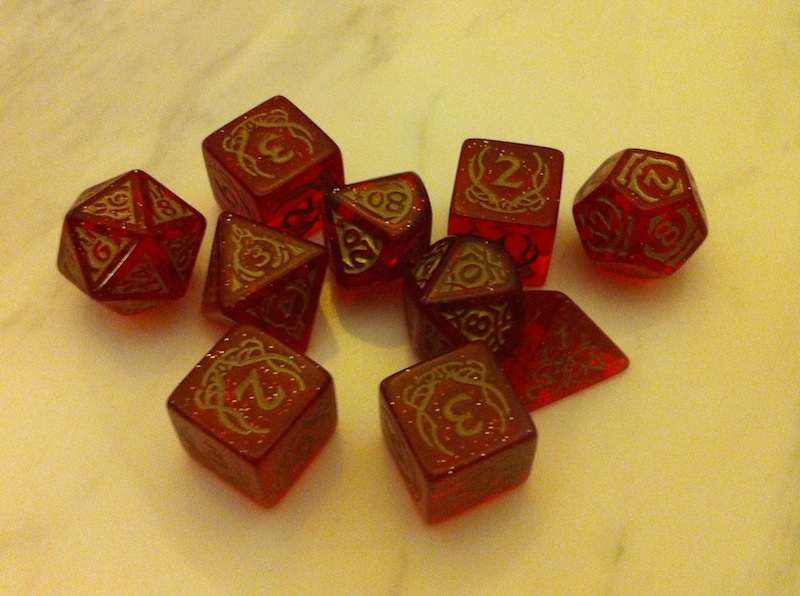 And on the topic of the dice, they are quite nice (though there should really be three six-siders, not four). The decorative work is intricate, but readability does not suffer. Despite some minor quibbles, within the context of other game boxes, the housing is nice. The covers of the reprint booklets have a nice texture but are definitely not as thick or sturdy as the originals. They feel like high quality paper rather than card stock. 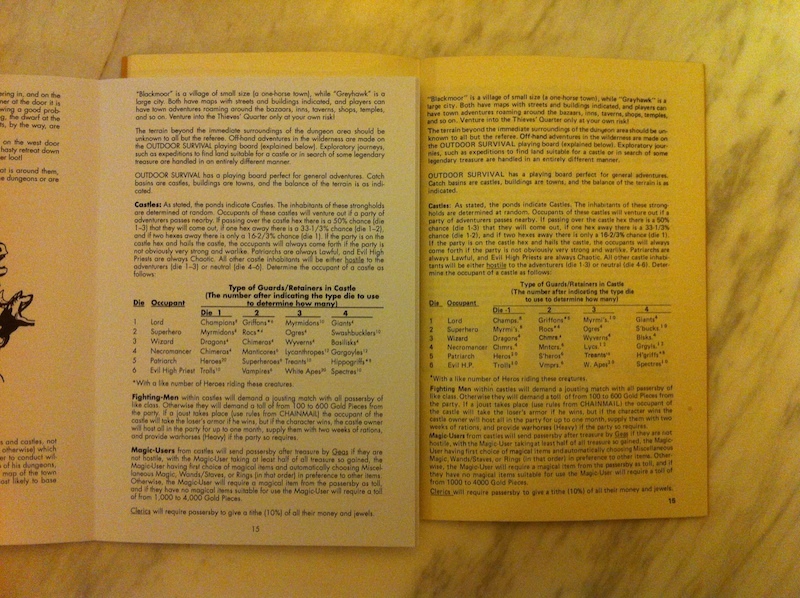 The supplement language has been replaced with a strict booklet numbering (for example, Supplement I: Greyhawk has become Book IV: Greyhawk). Given that many people online reference the supplements by the original numbering, this has the potential to be confusing to a newcomer, though this is a minor issue at most. I have also read complaints that the contents do not include Chainmail (and even that the Outdoor Survival map should have been part of the set). 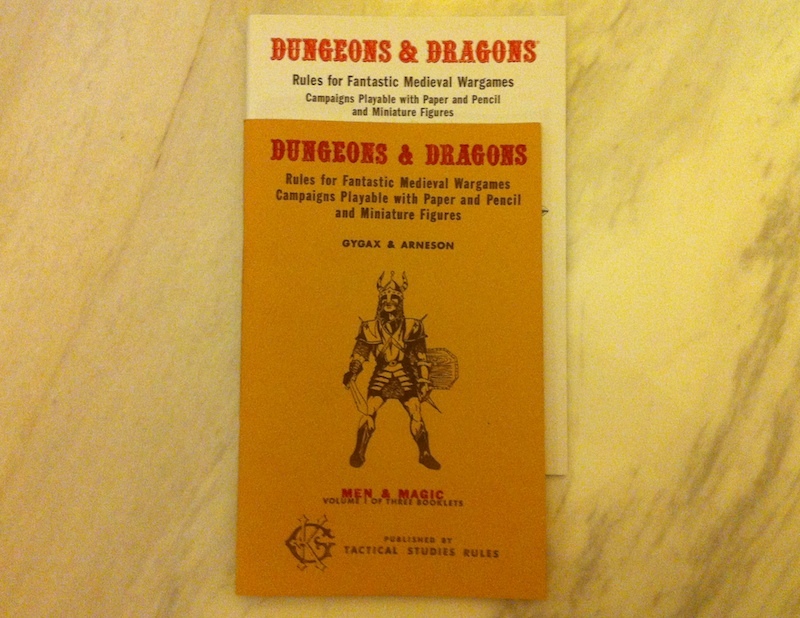 (Regarding OD&D and Outdoor Survival, see here, here, and here.) From my perspective, those things are not needed to play the game and are really more historical curiosities, so I do not mind their omission. 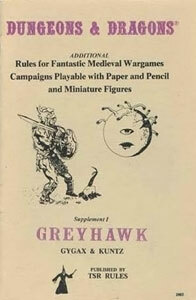 The booklet covers also have new art, and though there is definitely some charm to the original covers (I particularly like the beholder’s strange expression on the cover of the original Greyhawk), I do not mind the new covers. I actually quite like the summoner on the cover of Eldritch Wizardry (which can be seen in the photos below). The interiors seem mostly unchanged, though I think they use new layouts rather than imaged reproductions. Overall, though it is not exactly as I would have done it, in general I am pleased, and I am glad that the original books are back in print in some form. Ideally, there would also be PDFs and a collected, well-bound hardcover edition. While the second of those wishes does not seem likely (if for no other reason than it would require a new layout, which would be a nontrivial amount of work), it seems like PDFs at some point are within the realm of possibility. While I am considering what I might have done differently, I also think that some separate book explaining a bit of the context might have been good. WotC could have even looked into including a copy of Philotomy’s Musings (would that not have been fantastic?). Finally, I can see myself actually using this thing at the table, which is, in the end, what really matters for a game. I normally would not mention the vendor I used, but in this case the service was particularly good, so I would like to give them a shout-out. I ordered my copy from Barnes & Noble on february third, it shipped on the fifth, and it arrived on the eleventh with no import duties required (this can sometimes be an issue living in Canada). Their price was good, too, relatively speaking (subtotal: $107.99, shipping: $6.48, tax: $5.40, total: $119.87). 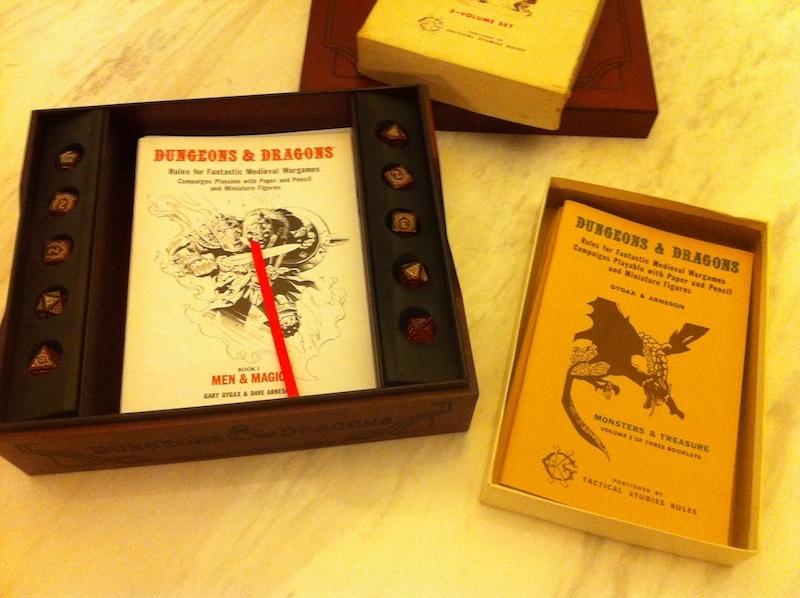 This entry was posted in Reviews and tagged OD&D on February 17, 2014 by Necropraxis. I was unaware that this included any more than the 3 base books. That makes it a lot more appealing. Although the butchered cover art is a huge turnoff. Particularly for Eldritch Wizardry. It’s also worth noting that the version of Gods, Demigods & Heroes included in the set is much abridged from the original printings; the Melnibonean and Conan material has been removed. Good idea on including Philotomy’s musings! I actually printed out my own chainmail booklet (using the booklet printing option in Adobe reader with the PDF I have of it) and added it to my box. Now I’m printing out a copy of Philotomy’s musings to add as well!